Healthy snacks? Yup, something I'm always in the market for, given how much I like to snack. And popcorn? My favorite. So I basically try any new popcorn I discover. 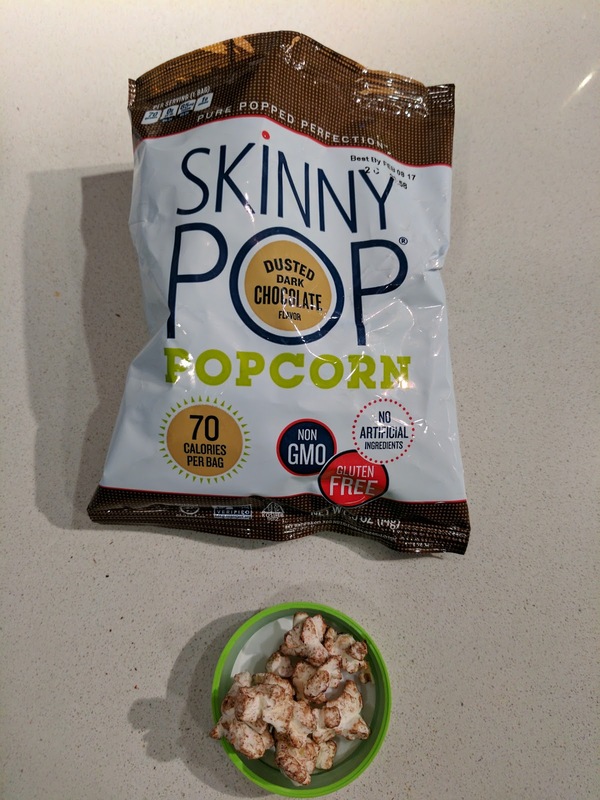 Skinny Pop is another line of healthy popcorn, non-GMO, gluten-free, dairy-free, preservative free, no artificial flavors, etc, etc. They use sunflower oil. They produce 6 flavors of popcorn, savory original, sea salt & pepper, white cheddar, and jalapeño, and sweet "naturally sweet" and dusted dark chocolate. "Guilt-free snacking with just the right amount of dark chocolate flavor." I went for the dark chocolate flavor, and was pretty disappointed when I opened the bag. It was ... well, dusted with cocoa powder, not covered in chocolate. Which, to be fair, is exactly what they said it would be. 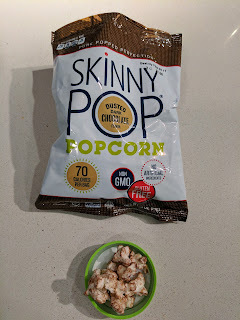 But I wanted dessert popcorn, not healthy snack popcorn. Once I got over my initial visual disappointment, I tried a bite. It was a bit strange, really. Just a touch of cocoa flavor on otherwise buttery popcorn. Salty, but not sweet. And chocolately? It was ok, but, the flavors just were not very intense. Meh. I threw it in the freezer. The freezer did manage to crisp it up a bit, but, the flavor still never intensified. If you want a very light, very subtle, chocolate experience, then perhaps this is for you, but for me, it just wasn't enough. Sacolinha is a chain of bakeries in Portugal. They just celebrated their 30th Anniversary, so, they seem to be successful. They offer a slew of baked goods and breads, and most locations also have a cafe menu. I visited two different locations while in Cascais, outside Lisbon. I stuck with baked goods on both my visits, as they looked amazing. 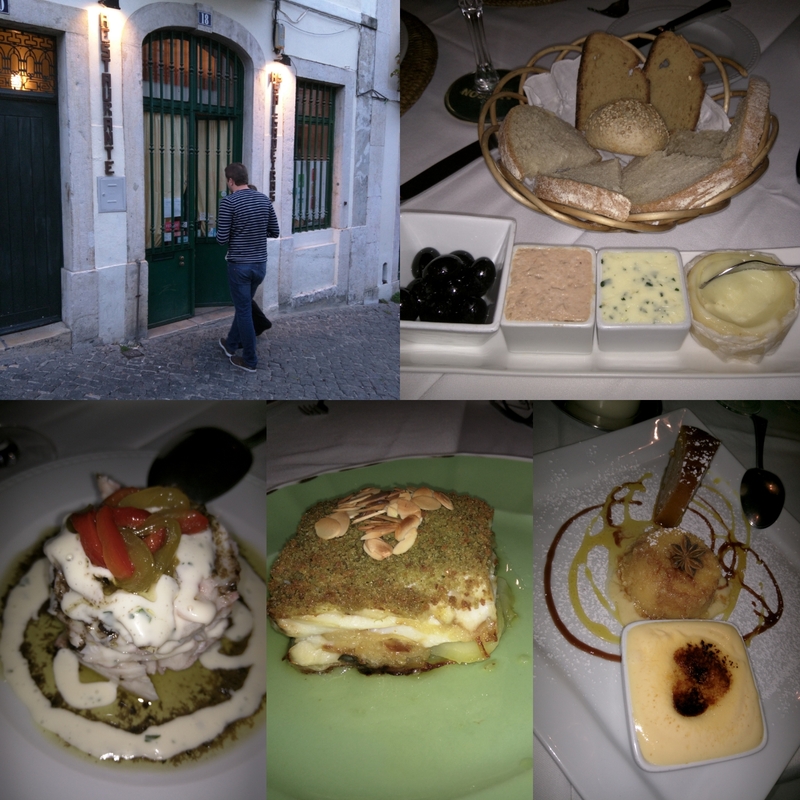 I'm glad I got to try some new Portuguese items, but, nothing was particularly good. 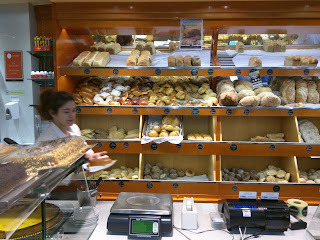 I visited 2 Sacolinha shops while in Portugal, one smaller one in the countryside and one in the main drag in Cascais. All locations of Sacolinha have the same signs, without the name of the actual establishment, just, the fact that they are a pastry shop and bakery. 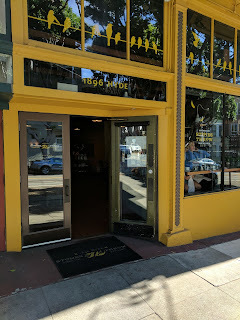 The two locations I visited also both had large glass windows that somehow seemed very inviting, as they looked so warm and welcoming, and, well, I could see pastries. They also both had indoor and outdoor seating. Inside, is a bit of chaos, and not nearly was welcoming as it looks from the outside. Like many places, you are supposed to take a number from a dispenser before ordering. Or, multiple numbers, one for bakery items and one for pastries. You take a number, get called on, and order your items. And then you go pay somewhere else. Cash only. 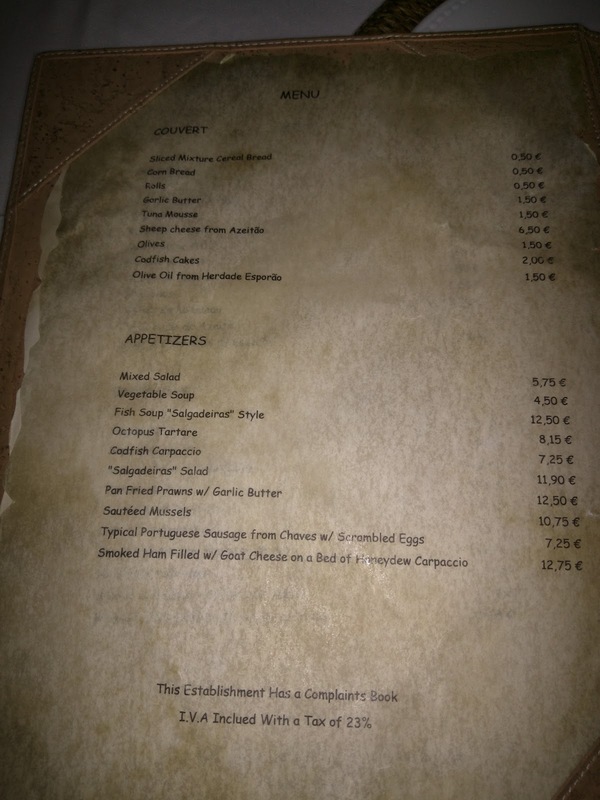 The ordering experience was fairly confusing, as was rather common in Portugal. Not having one person touch food and money makes sense, but, they really don't have much indication anywhere of how you are supposed to do things, and nearly every bakery I went to handled things differently. The assortment of items at Sacolinha was the greatest of any bakeries I visisted. 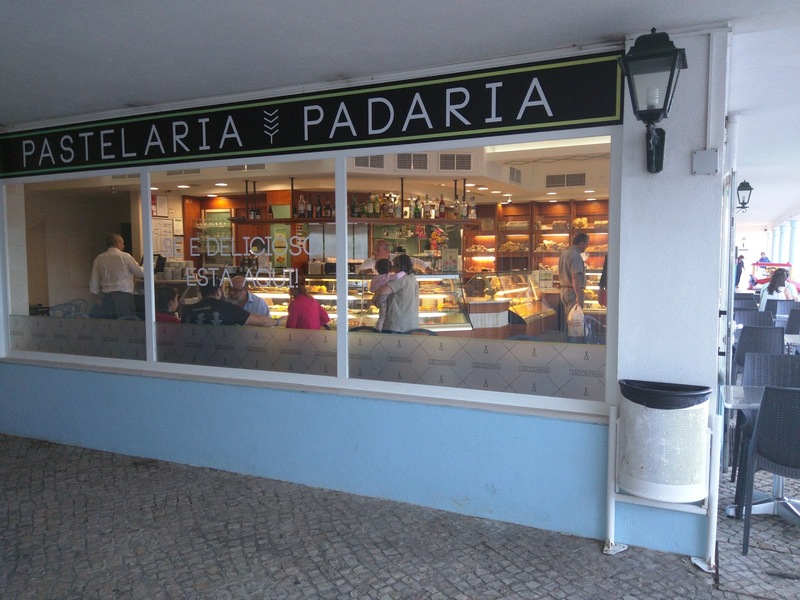 All the traditional Portuguese pastries, plus plenty of French pastries, tons of cookies, savory pies and pastries, and more. Unfortunately, my camera stopped working as I went to take photos of the display cases, so, you only see the most boring stuff here, the cookies. The other cases were loaded with croissants, cakes, tarts, miniature items, and all sorts of mouth watering goodies, more than half of which I couldn't identify. Bread items were a bit further back, on shelves, and were also extensive. Loaves of bread, rolls, buns, and more, savory and sweet. I never got a chance to try any of these. They also have a cafe menu, available only if you are staying to sit down. We asked to see the menu to take a look to decide if we wanted to get non-baked goods, and were met with a lot of resistance. It contains sandwiches and salads mostly, none of which looked very good, so we opted to just go for baked goods. 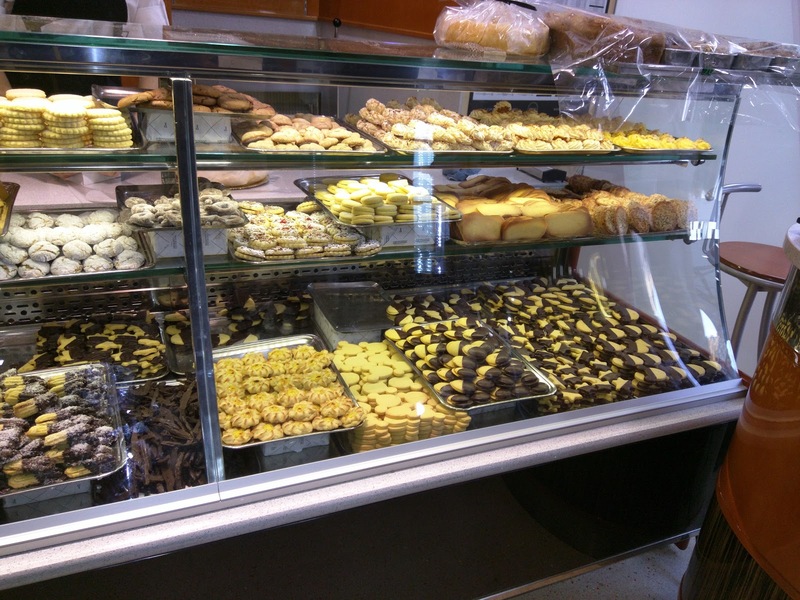 The reason I visit a bakery is for the baked goods. I used this visit to try two items new to me. They make a slew of baked goods, in full size and minis too. I had been eying bolo de arroz the entire time I was in Portugal. I'm not sure why. They just look like cupcakes, sans frosting. I don't really like cake, cupcakes, or the like, and why would I want one without the only part I usually care about? I really don't know. But on my final day, I decided enough was enough, and I picked one up, on our way back from McDonald's, as, uh, I didn't really care for the Portuguese specialties there. 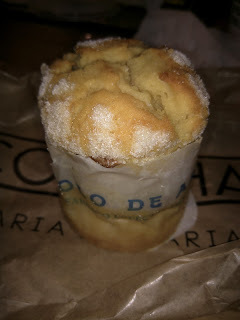 Bolo de arroz seem to always come in a paper wrapper, the only item I've seen like this. Like a cupcake wrapper as I am accustomed, but, they always say "bolo de arroz" right on them. I have no idea why. They are also a little taller and thinner than traditional American cupcakes and muffins. The top was crisp, coated in sugar. The entire thing was super dense, but very moist, almost gooey inside along the edges where sugar caramelized. It was overall far sweeter than I expected. It tasted faintly of rice, sorta like mochi, but, cake. It was very buttery. There was something incredibly familiar about this that I couldn't ever pinpoint. Yes, cake, but incredibly buttery, sugary, slightly rice-y cake. There were also enough addicting elements to keep me going back for more, even though I didn't love it. Specifically, the little pools of gooeyness and the crispy bits of caramelized sugar along the edges. I'd like to try another from somewhere else to compare. This is an item that I assure you is not what it appears. It looks like glazed bar donut, right? It is not, and I knew it wasn't. I had done my research! It is a Brisa, a "Breeze". 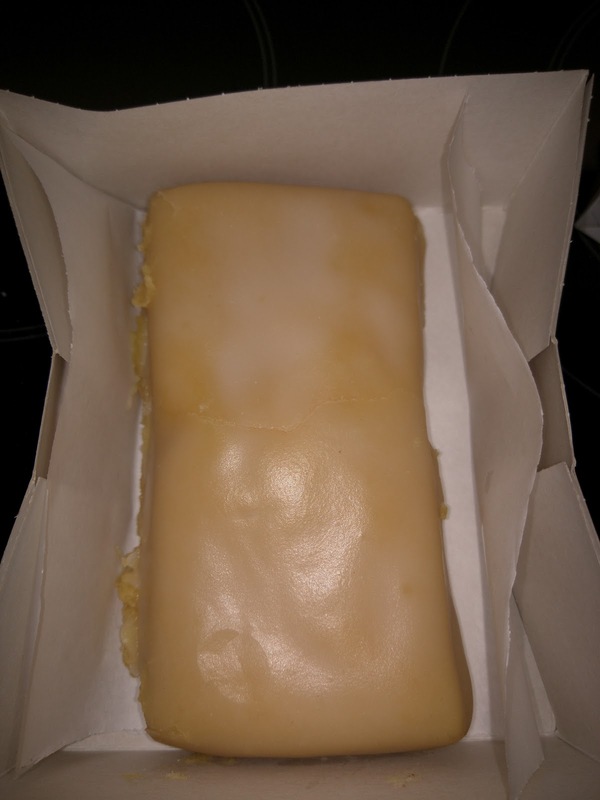 Instead, it is a puff pastry base, with a thick layer of doce de ovos (sweet egg cream), with a thick layer of glaze on top. Crazy right? Definitely not a donut. I needed to try it. The puff pastry was ok, not super flaky or amazing, but, ok. The egg cream was thick and not too sweet nor too eggy. The icing? Crazy sweet. Overall, certainly different, but not particularly great, and a bit too sweet (that said, I was really, really sick of sweets at this point, having gorged on Portuguese sweets all week). I don't have a photo, but I also tried a mini Queijada de Amêndoa, a little almond paste filled tart, that looked sorta like a mini pastel de nata, just with a twist, hence why I picked it. The shell was mediocre, more like a tart shell than crispy pastry, the filling gritty and sweet, and overall, it was very lackluster. Not sure what I expected though. I wanted to love Stone's Throw. I really did. It opened several years ago, and seemed to be everyone's favorite neighborhood darling. You know, the sort of place you desperately wish was in your neighborhood. The sort of place that feels welcoming and homey, with an approachable menu at a reasonable price, but when dishes are set down in front of you, you need to take a moment to admire the plating. Add in a signature dish or two that people can't stop raving about, the fact that they take reservations for brunch (! 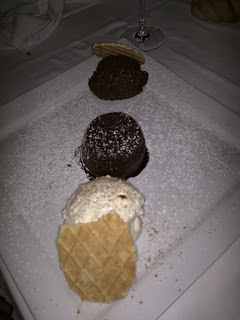 ), and an entire dessert menu that is remakes of childhood dishes, and, well, it sounded like a recipe for success for me. All those elements did ring true for me. It was a comfortable place. The menu was fantastic, and the plating beautiful. Food was well prepared. The service was friendly and never invasive, and they were on top of things like refills, share plates, and serving utensils. Yet ... it didn't add up to anything special. I visited twice for brunch, once solo, and once with a group of four. I've also tried said signature dish at events around town. That dish is a stunner, but everything else ... is just fine. Certainly not bad, but, just, fine. Stone's Throw is located in Russian Hill, definitely not my neighborhood, but an area with a great neighborhood vibe. The outside is warm and inviting, painted yellow, with cheery birds painted on the windows. No outside seating or sidewalk decoration besides the entryway. 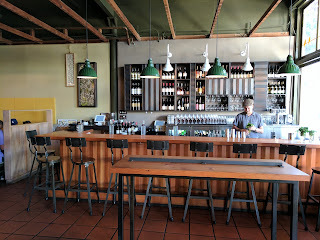 The front of the restaurant features the bar, with counter dining for walk-ins. Open and light filled, particularly on a weekend morning. I'm not sure how crowded it gets in the evening, but the bar space didn't feel cramped. Ceilings are high, with exposed wooden beams. The yellow theme from the front paint job continues on the walls. The tables, like the bar, are wooden, as are the benches along the outside walls for seating. Interior seats are padded wooden chairs. 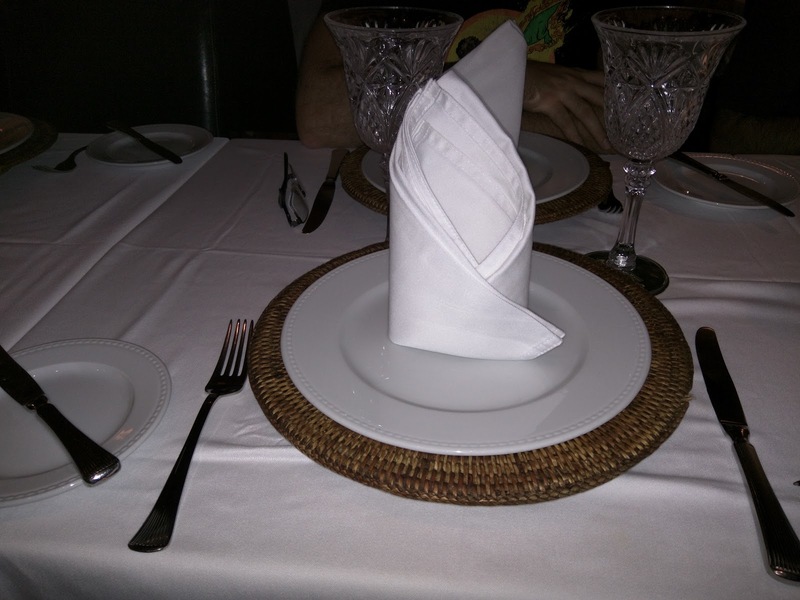 Silverware, stoneware plates, and cloth napkins made up the initial place settings, along with a water glass. The drink menu, even at brunch, is slanted towards alcohol. The first page of the menu is broken into three columns, only one of which is the food menu, another is beer, wine, cocktails, and the final column is "large format libations", as in, pitchers of Pimm's or mimosas. The next three pages of the menu are all beer and wine. I saw some folks order juice, but they are not on the menu. Nor is coffee, although I was able to order that. Tap water was offered in a jug, but half our group opted for sparkling. They gave us different styles of glasses to keep track of which type of water each person was drinking. They do not have espresso drinks, only coffee. 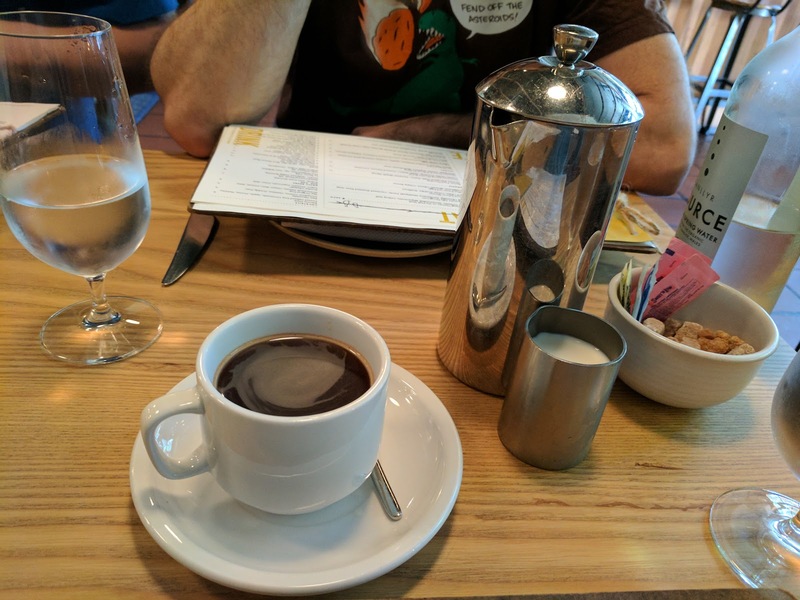 Since I wanted decaf, I was given my own little french press, with assorted sweeteners and sugar cubes on the side, and a tiny pitcher of milk. The presentation was nice, but the coffee lacked any flavor. At least it didn't have "decaf funk", and it wasn't too acidic, but really, it was the least complex and least interesting coffee I've had in a long time. Still, I really like having coffee alongside my brunch, so when my french press ran out, I ordered another, hoping that perhaps the first was just poorly brewed. No luck, the second one was just as lackluster. 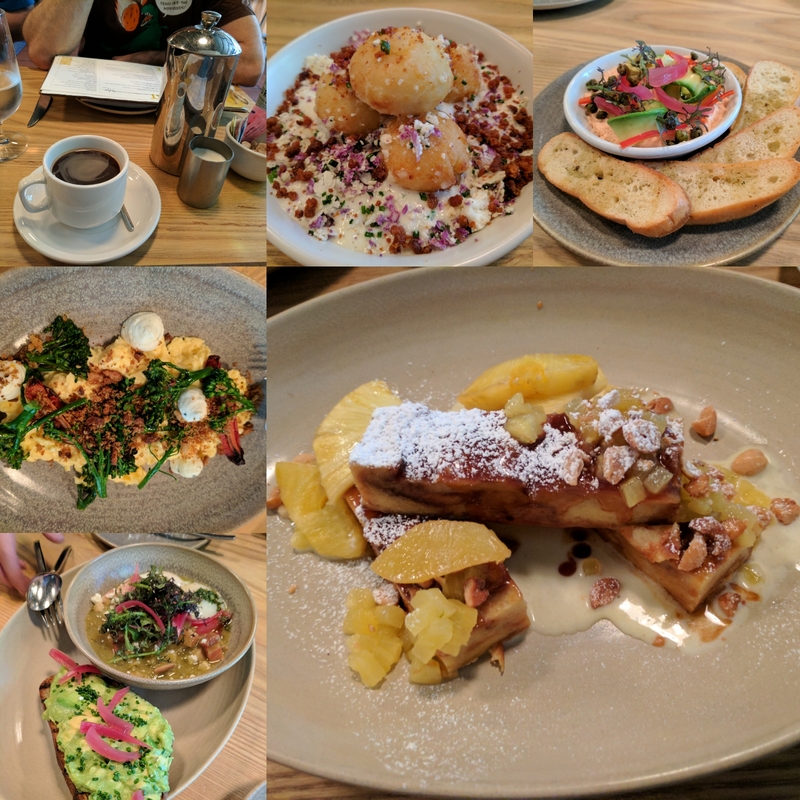 I visited twice for brunch, once alone, and then a year and a half later with a group. The brunch menu is divided into 3 sections: snacks, sweets, and savory. It comes tied on a wooden board, with more yellow accents. The snacks section doesn't change much; it always has simple oysters, smoked salmon mousse, and their signature puffed potato and egg, along with a seasonal variety of doughnut. Four items, all generally well reviewed, $8 each. Stone's Throw has found some hits with this lineup, and haven't messed with it, sans switching out the filling in the doughnuts. 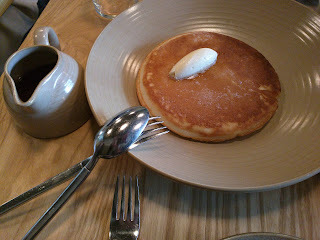 The sweets section has only three items, one of which is always the signature butter-fried pancake. Others rotate between different styles of other sweet breakfast carbs, like french toast, bread pudding, and crepes, ranging from $12-15. Finally, the savory section always has a token salad, several egg based dishes (one soft scrambled, one with a hash), and their other signature dish, "Da Burga", generally slightly more expensive than the sweets. For our group of 4, we opted to get two snacks, one sweet, and two savory, which was plenty of food, but not overwhelming. Snack: Puffed Potato & Egg. $8. 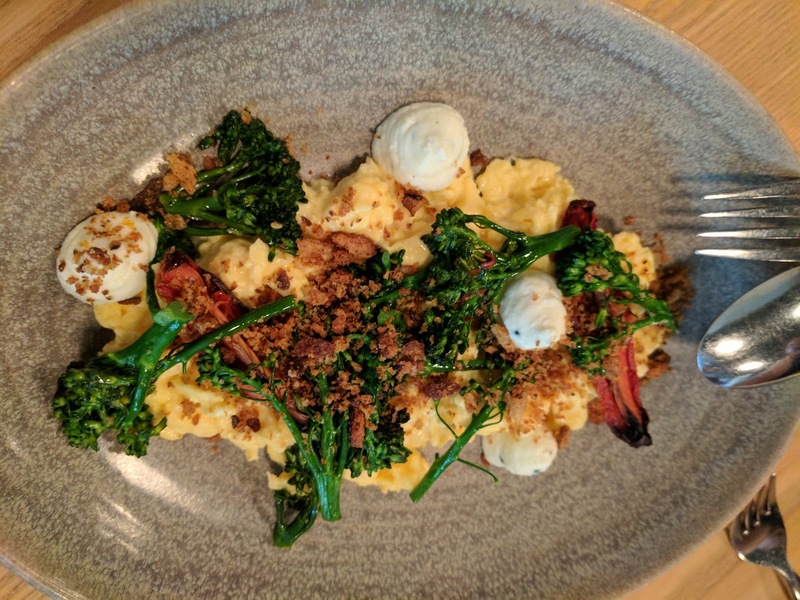 While Stone's Throw has a number of signature dishes, the puffed potato & egg is certainly the dish that put them on the map. It is available at both brunch and dinner, although at dinner the crispy bacon is swapped out for crispy chicken skin. It is also the one dish I had tried long before I visited the restaurant in person, and was the reason I wanted to return. The dish comes with 4 balls, stacked into a little tower, served on top of a base of cauliflower mousse. The mousse is more like a sauce really, perfect to dunk your fried potato & egg ball into. The bacon bits are on top the mousse, salty, crispy. Tasty, in the way that little bacon bits are. I like these components, but, our mousse was lukewarm at best, it clearly had been plated a bit too early. But the star is the potato and egg balls. They were nearly as good as I remembered. Crispy fried potato shell, yolk inside that comes oozing out if you cut into it (or, do as I did, and pop it into your mouth whole, knowing the goodness inside that is about to come spilling out, just like a soup dumpling). The fried bit wasn't greasy at all. I enjoyed the dish for sure, but it being lukewarm was of course a bit disappointing. Creative, unique, and signature for a reason. My favorite dish of the meal, and one I'd still get again. $2 a ball seems entirely justified. Snack: Smoked Salmon Mousse. $8. "Bagel Chips, Creme Fraiche, Scallions." I decided to get a second snack for the table as well, the smoked salmon mousse. No one seemed very interested in it, but I had read many stellar reviews of it, and I wanted us to have a little more food, but didn't want to get a fourth entree as that seemed like too much, so this seemed like a good middle ground. The bagel chips were sliced bagel made into crostini. More fun than regular toast points I suppose, and obviously smoked salmon and cream cheese go on bagels, but I didn't find them particularly interesting. The mousse was light as could be, with a slightly smoky flavor, not fishy. 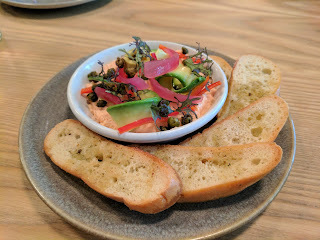 The pickled red onions were crazy tart, the capers added a nice briny saltiness, and, for those not allergic to avocado, I'm sure the avocado was another rich creamy component. I was a bit annoyed that there was avocado, as the menu description didn't list it. I should have mentioned my allergy though, my bad. The description also said creme fraiche, which I guess was just mixed in to the mousse? Overall, good for a smoked salmon mousse, and beautifully presented, but it didn't quite do it for me. I appreciated that they gave the right amount of bagel chips for the quantity of mousse though. Savory: Soft Scrambled Eggs. $14. "Chili & Garlic-Spiced Broccolini, Oven Roasted Tomatoes, Whipped Ricotta." For our first savory dish, we went with the soft scrambled eggs .I'm personally not an egg eater, but the group was leaning more towards savory than sweet, and I knew I'd likely be plenty happy with my puffed potato and then just the sweets anyway. But if I was going to pick an egg dish, this would have been it. Every once in a while soft scrambled eggs can be quite magical. I still remember the first time I had them at the (now closed) Il Cane Rosso, and my mind was blown. These ... weren't magical. They were just scrambled eggs. They even seemed a bit dry, not the rich, soft, creamy texture I was hoping for. There were only two chunks of the oven roasted tomatoes, so I let my dining companions go for those. I'm still not really sure what the breadcrumb like topping was, but it gave a little crunch. 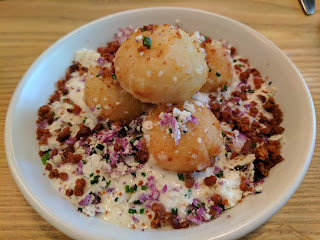 The whipped ricotta was the one element to the dish I was really excited about. But ... it wasn't great. It didn't really taste like ricotta, rather was quite plain. Overall, nothing in this dish did it for me, and it also seemed like it really needed a bread element of some sort. My least favorite dish. Savory: Chile Verde Braised Pork Belly. $14. "Masa, Poached Eggs, Avocado Toast." 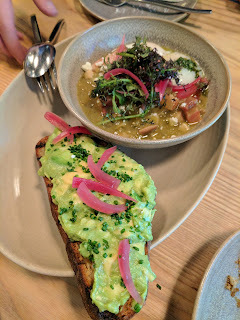 The chile verde and the avocado toast on the side both came topped with more pickled red onions, which really seemed to be the garnish de jour. This too wasn't great. The chile verde wasn't particularly flavorful, and the masa was kinda just lumps mixed in. It really needed some oomph of some sort. It was the one dish that went unfinished at our table. Since I'm allergic to avocado I couldn't try the toast, but it actually looked pretty good, a thick slice, topped with plenty of avocado mash. 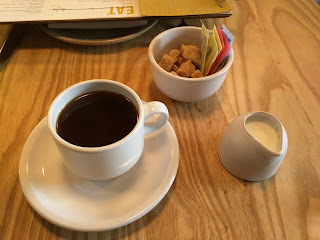 So trendy though, and it seemed a bit excessive alongside the big bowl of pork belly chile verde with two poached eggs. Sweet: Hawaiian Sweet Roll Bread Pudding. $12. 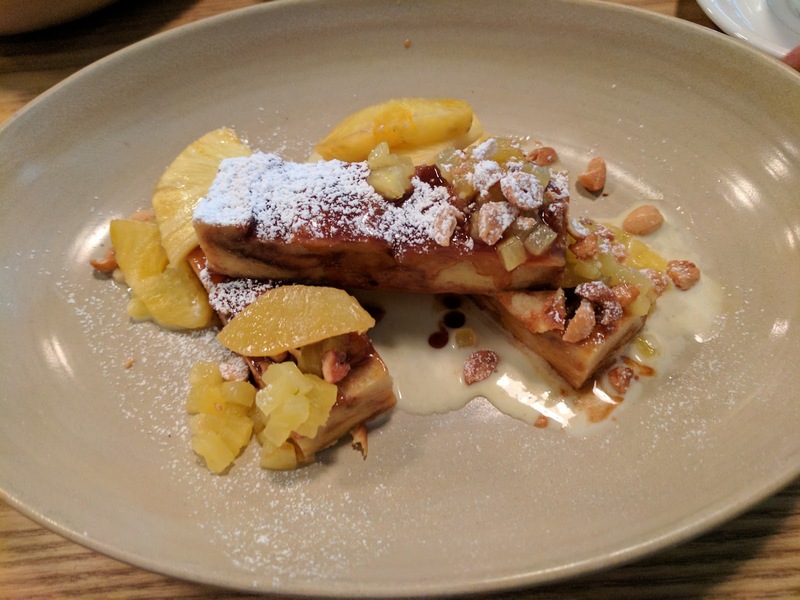 "Pineapple, Macadamia Nuts, Creme Anglaise." Like our other entrees, this let me down. I'll start with the positive. The portion was quite large, 3 large chunks of bread pudding. It was warm and moist. But ... that is about where my positives end. I didn't taste Hawaiian sweet rolls. It tasted like any plain white bread as the base. It wasn't custardy, it wasn't crispy on top, and it didn't have much flavor. 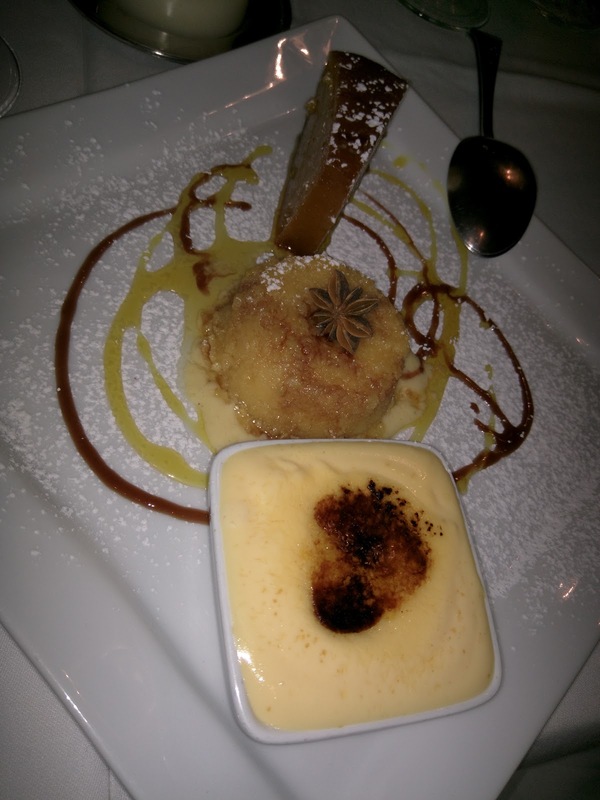 I tried to find flavor in the accompaniments, but the creme anglaise was entirely flavorless, and there was just a little pool on the bottom, not really enough to drench your chunk of bread pudding in. The pineapple I guess was flavorful, but it wasn't particularly good. Large chunks and some diced pineapple. I didn't taste any different from canned pineapple. And finally, the nuts. They were not macadamias. They were peanuts. I like peanuts, but, um, this was supposed to be Hawaiian, and the menu said macadamias. They should have mentioned the substitution when we ordered. This dish desperately needed ... something. Some spicing, a different sauce, just, something. I almost asked for some maple syrup at least to drizzle on it. Once we finished eating, one of my fellow diners asked if we were all satisfied. He wondered if we should order something more. I admitted that my sweet tooth wasn't really satisfied, but I didn't think ordering more there would do it. He agreed, and said he wanted "something yummy". Since Bob's Donuts was just a few blocks away we headed straight there to get donuts. I think that about sums up the experience. It just left us wanting something else. My first visit was alone, as a friend was supposed to join, and got held up. 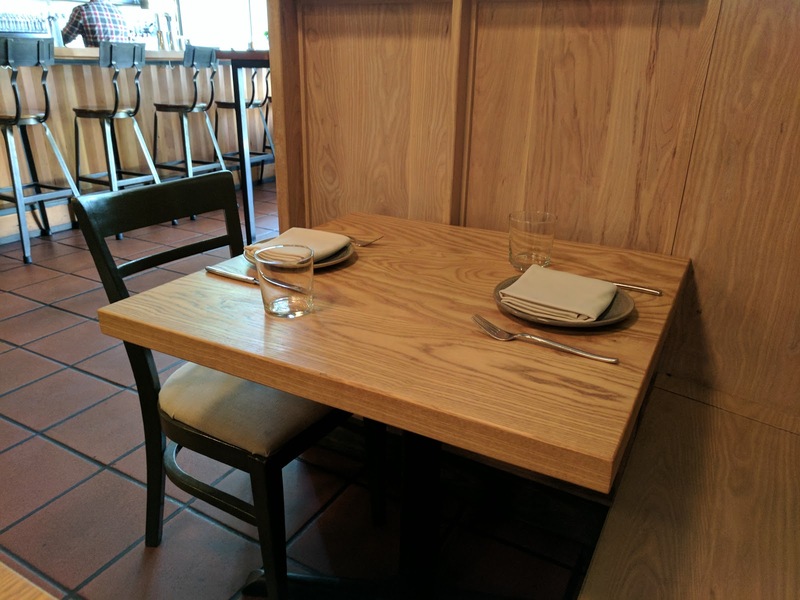 I decided to dine alone anyway, and the staff were very friendly. The decaf coffee just wasn't very good, even though it was served in a french press. This was true on both my visits. I drank a lot of it while waiting for my friend. "Strauss European Style Butter, Vermont Maple Syrup." A stack of pancakes is usually two decently large pancakes, fried in butter. I knew I wanted to try the pancakes, but since I was dining alone, I didn't particularly want to stuff myself silly on pancakes. Of course, I had done my research, and knew I could ask for a half-order, even though not listed on the menu. The pancake is not only fried in butter, it comes topped with additional butter. The syrup is served in a matching crockery small pitcher. I took great notes while I ate this, as I was dining alone. And ... I lost them. I don't know how. And I didn't write it up soon after the visit as I normally do, so I didn't notice that they were missing, until I came back to edit and realized my review stopped after the above intro. Doh. I say visit #0, because my first encounter with Stone's Throw was not actually at the restaurant. 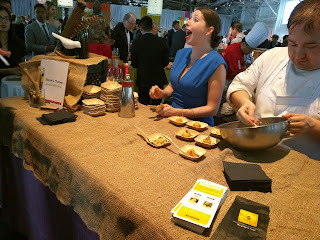 Rather, it was at the annual Meals on Wheels Gala, where they featured their signature Puffed Potato & Eggs. I did a quick little write-up about the Gala for my mom, so, I actually still had notes even though I wasn't planning to blog it. 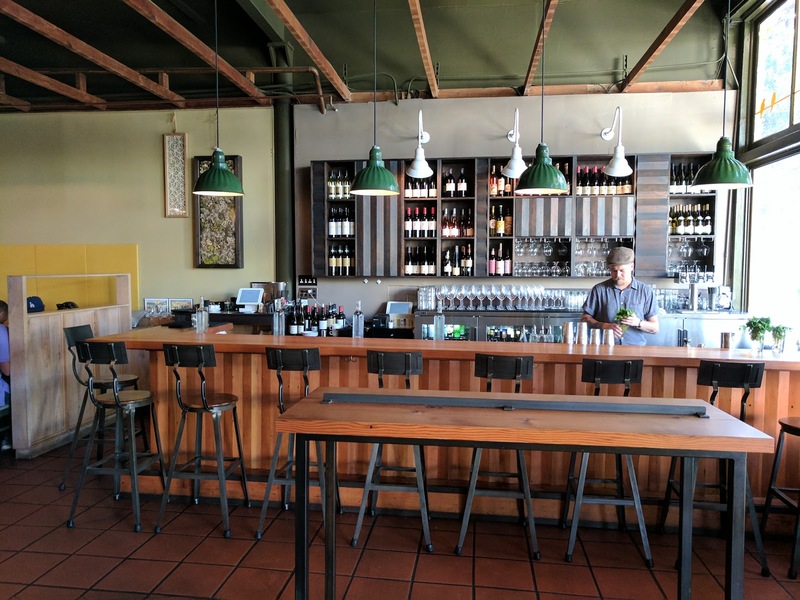 Stone's Throw has been on my radar for a while, somewhere I've really, really wanted to go. And luckily for me, they were offering up their signature dish: "Puffed potato and eggs". What is it? A deep fried mashed potato ball with an egg yolk inside, served over creamy cauliflower puree, topped with crispy chicken skin. They actually had little deep fryers behind them, and were frying fresh to order, about 10 at a time. They basically always had a line, and were totally running behind all night long, but the wait was worth it. I heard numerous people making plans to go back for seconds. Second best dish of the evening for me. Creamy potato, crispy crust, and gooey egg. I refuse to admit how many times I went back to their booth. Devine. I really can't wait to visit Stone's Throw now! During my time in Lisbon, I organized a few large group dinners. 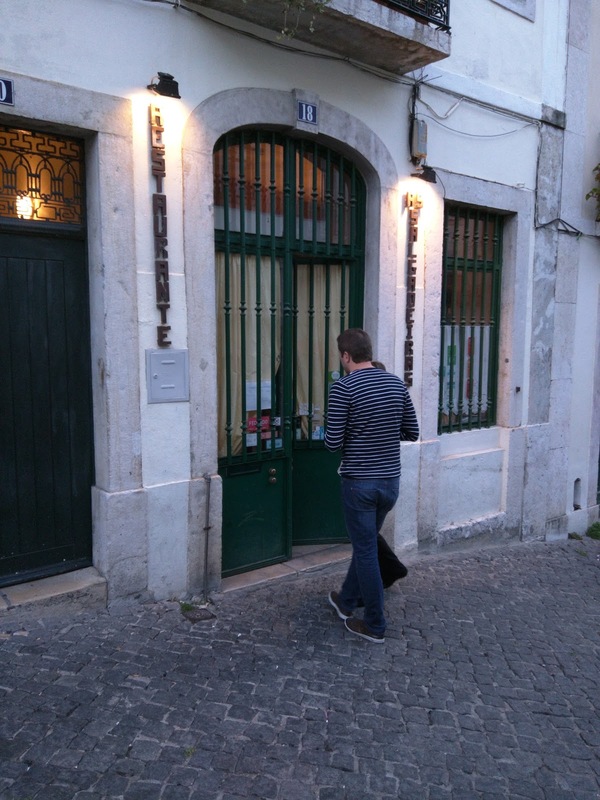 None were great, but, Lisbon isn't exactly a culinary mecca, and large group dining is never a strong point of a restaurant. For this meal, I managed to have a smaller group ... only 10! 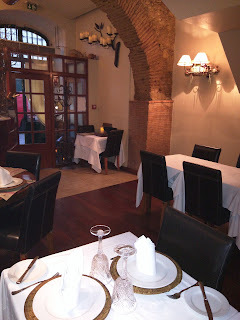 So, we were able to pick a small restaurant, As Salgadeiras. It was certainly not a tourist destination, and certainly not used to hosting huge groups. It was a lovely setting, really quite charming, but, the food was mediocre, and the entire dining experience felt like pulling teeth to progress to the next phase. I wouldn't return. 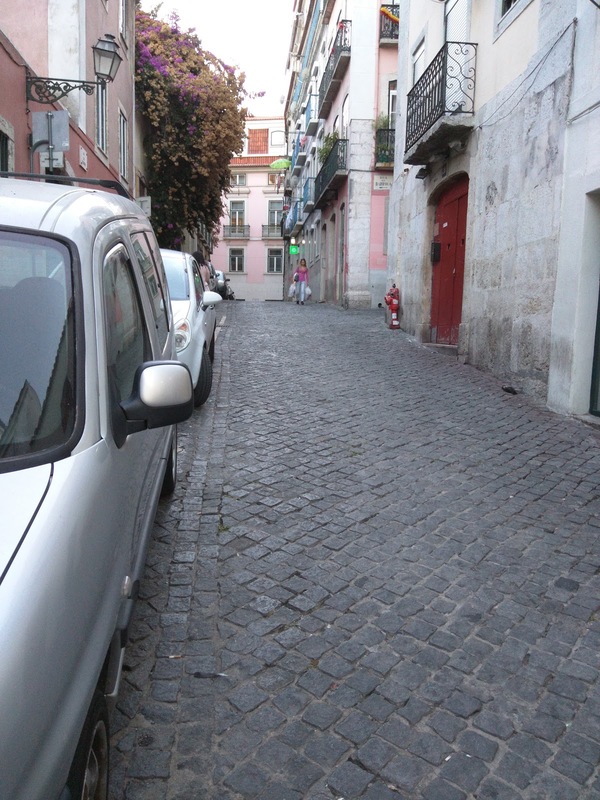 As Salgadeiras is located in Bairro Alto, a historic neighborhood, down a maze of streets that are most certainly not a grid. While it might have been a bit hard to find, once inside, it had a ridiculous amount of charm, and was unlike any other restaurant I visited in Portugal. It was the most authentic, and least touristy location I dined. To reach the restaurant, you walk down a narrow alley, filled with both foot and car traffic. This seemed like a place where "real" people lived, as I watched locals walk by with groceries on their way home. It was really easy to miss the front entrance, as it blended right in with the rest of the residential doors on the street. I walked right by it initially, as did my colleagues. Right inside the door was a stand with an old fashioned, leather bound menu, with one side in Portuguese, and one in English. I was surprised by how small the restaurant was. One main room, set with two tables of 10 (one for us, and, amusingly, one for Emil and 9 others who had a later reservation time, totally unplanned), plus only 3 other tables. There was also one small side room, under another arch, with about 3 more tables in it. Not a large place at all. There was no bar area, no waiting area, really, no extra space. It felt cozy though, not cramped. The decor helped with the feeling of cozy, with dark wood floors, brick arches, and real burning candles on the tables and along the walls. The chairs were black leather, and really quite comfortable. Tables were set with white cloth table cloth, woven chargers, bread plates and knives, and white cloth napkins. The glasses were huge, stunning chalices. I enjoyed drinking out of such a ridiculous thing. 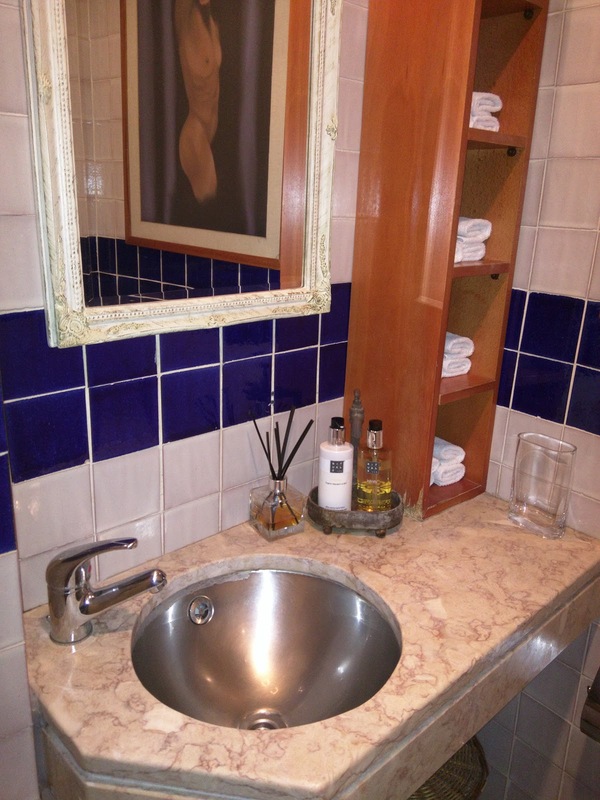 Even the bathroom was adorable, with real cloth washcloths to dry your hands, a marble countertop, and shiny basin. The soap and lotion seemed to be quite high quality. 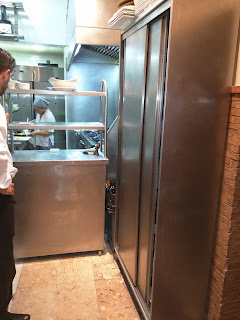 The kitchen was tiny, and, at least when I walked by to use the bathroom, staffed by a single older lady. How did she pump out dishes for a party of 10 all on her own! I mean, the meal took forever and was crazy slow, but, it didn't seem like the food preparation was actually the slow part. More on that soon. Once we were seated, we were offered water. Those who wanted sparkling water were given a green coaster to put under the base of the goblet, so that the staff would know what type of water to pour in. I'm really not sure I've ever seen that technique used before, and it made plenty of sense. After we got our initial round of water though, uh, nothing happened. No menus were brought. No wine list. Nothing. After 20 minutes, yes, 20, I asked for the menus. So we got the menus ... 10 minutes later. This theme would continue throughout the meal. We had to ask for everything, and every time it took forever, and I felt like we needed to be aggressive in order to get anything. Water was never refilled without our asking. The meal, that we thought would be maybe an hour and a half or so, stretched from 7:30pm (time of seating), to 8pm (time of menus), to 8:30pm (time of first appetizers), to 9pm (first main hit the table), to 10pm (dessert menu delivery), to 10:30pm (dessert), to 11:30pm (! finally getting the bill and port). 4 hours, and it only felt like things progressed because we kept asking for them. That said, I don't think the service was *bad*, this seemed by design. I'd say it must be Portuguese culture, but, we didn't experience this anywhere else. 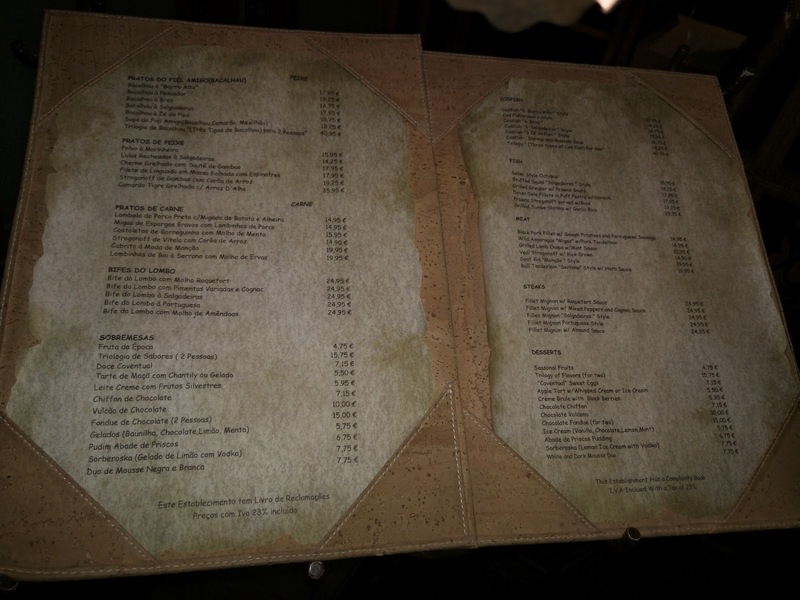 The menu matched the decor, leather bound, it looked like wood. They use the same menus for Portuguese and English, but, put English inserts into the cover on top of the Portuguese ones. 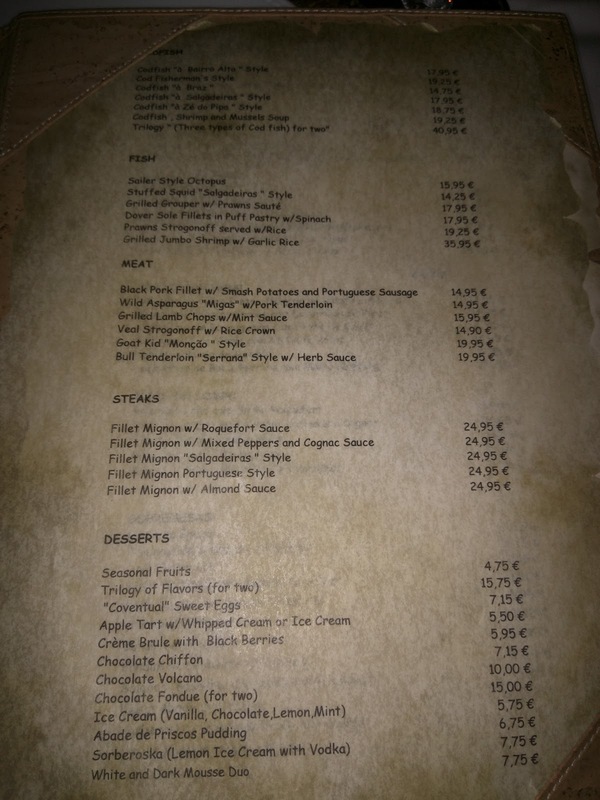 The first page of the menu is the "Couvert" and Appetizers. I'm still not sure what "Couvert" means, but, this was the list of breads, cheeses, olives, and spreads that always show up on your table in Portugal. But, unlike as you might expect, this is not like bread and oil in an Italian restaurant, or chips and salsa in a Mexican restaurant, you will be charged for these items based on consumption. If you don't touch it, they'll take it away, serve it to someone else, and you won't be charged. Even though it has been on someone else's table, and they totally could have ... sneezed all over it. The Appetizers are mostly soup, salad, and cold Portuguese classics. The only hot items are sautéed mussels and pan fried prawns. Page 2: Codfish, Fish, Meat, Steaks, Desserts. 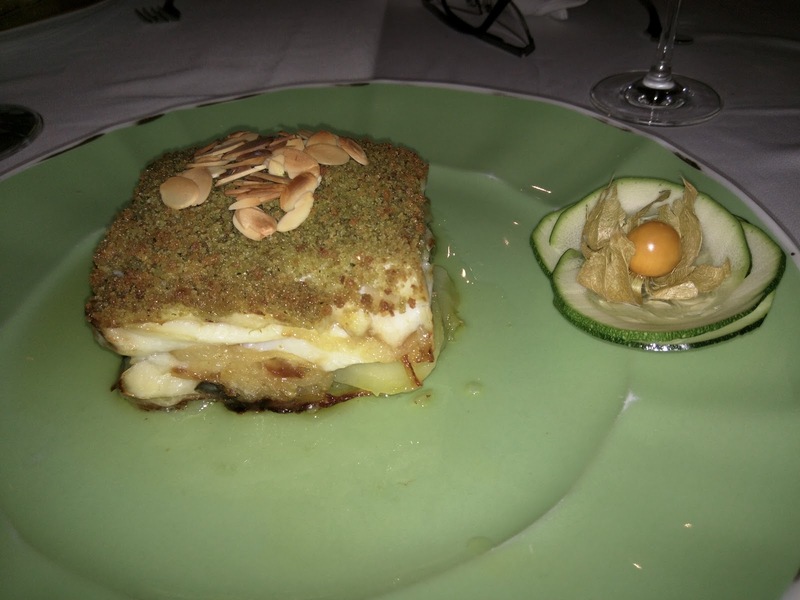 The signature item, here and at many Portuguese restaurants, is codfish. The menu has an entire section devoted to codfish, in addition to the normal fish menu. There were 7 codfish dishes, all of which had names like “Bairro Alto”, “à Braz”, “à Zé do Pipo”, etc styles, with no descriptions. The server didn't offer to explain them, but once we asked, he rattled off the ingredients in each. The fish menu has other items like octopus, squid, grouper, sole, and shrimp. Meats include pork, lamb, goat, and bull (! 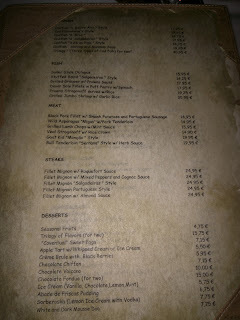 ), plus a separate section for steaks (5 different versions of fillet mignon). 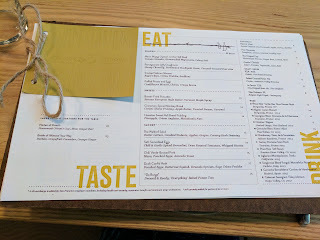 I was thrilled to see the dessert menu listed on the main menu, so I could plan my feast accordingly. I was delighted to see that they offered 12 desserts. I had much to look forward to ... hours later. Once we finally ordered, when we asked to order, the Couvert showed up immediately. It was ready the whole time we were just sitting there. 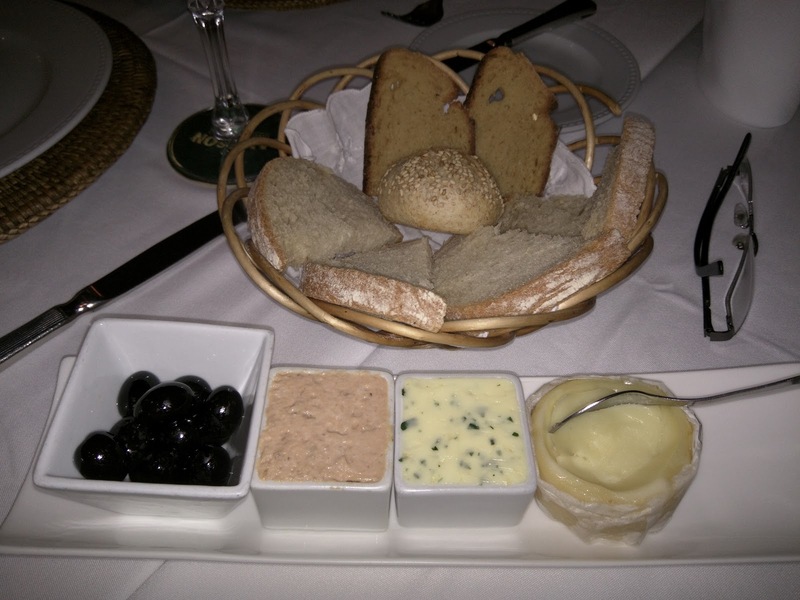 We received a number of baskets with assorted breads (mixed cereal bread, corn bread, and rolls, (0.50€) each), and a tray with garlic butter (1.50€), tuna mousse (1.50€), Azeitão cheese(6.50€), and black olives (1.50€). I tried the thin, slightly yellow bread on top that I believe was the cornbread, although not American style. It was a bit gritty (not in a bad way, in a cornmeal way), and slightly sweet. I quickly learned on this trip that I don't really like Azeitão cheese. It was served to us, always in the rind and with a little spoon like this, nearly everywhere. It isn't a super soft runny cheese, but it isn't a hard cheese either. It didn't have much flavor, and was kinda squeaky. The tuna mousse sounded more exciting than it was. It really was just like very mushy tuna salad, lots of mayo. It tasted no different to me than canned tuna salad. The garlic butter was great though, lots of flavor and herbs, tons of garlic. I really liked the garlic butter, and slathered on the corn bread it was a winner, the highlight of the meal for me. Had I known that of course I would have had more, but I tried to limit myself to just one slice, which proved hard given how slow service was. They were eager to refill these, but also eager to take them away. It was the only action the staff ever seemed eager to do was fill or take away our bread and spreads. I was the only person in the group who wanted an appetizer, as the others were happy with breads and spreads. But, I had read about this one dish, and really wanted it, so, I got it even though no one else ordered apps. It wasn't what I think of as a tartare exactly, as the octopus wasn't chopped, but it was thinly sliced, arranged into a tower. The octopus was ... fine. It wasn't chewy or rubbery. Decently prepared. It was coated with a creamy mayo-like sauce, drizzled with plenty of oil, and topped with pickled peppers. The mayo sauce was tasty enough. To me, this tasted no different than tuna salad. Mayo and mild fish. I was not really blown away. Ojan said it tasted like chicken. I disagreed, as I hate chicken and didn't hate this. Since neither of us really liked it, we quickly offered it up to the others, to take their votes. Everyone said it tasted like chicken. I'm still going with tuna salad. 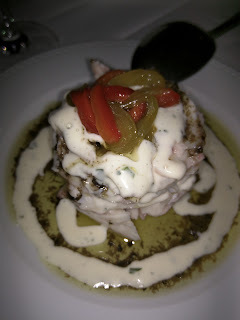 Main: Codfish “Bairro Alto” Style. 17.95€. For a main, I opted for a signature codfish dish, since that is what the restaurant prides itself on, and, that is what reviews all say to get. I opted for "Barrio Alto" style, which was topped with herbed breadcrumbs and slivered almonds, and layered with sliced potatoes, spinach, and caramelized onions. I didn't like it. The sliced potato was just cooked sliced potato. The entire dish was rather oily. The codfish, well, it was salt cod, and, it was just .... firm, salty cod. It turns out, I just don't really like salt cod. The crumble on top was a herby breadcrumb mix, and it wasn't crispy, and was pretty soggy from oil. Not the most appealing texture. The spinach and caramelized onions were actually quite tasty, and I did dissect the dish to extract all the veggies, but otherwise, this dish didn't really make me want a second bite. On the side was sliced cucumber and a tomatillo, arranged like a flower, which seemed incredibly random. The cucumber was fresh, crispy, and juicy. Every dish came with a different random side like this, others had a cherry tomato in place of the tomatillo. The portion was also massive, like all the entrees. No one in our group was able to finish a dish alone, so I highly recommend sharing. One other diner opted for a steak as his main, with a creamy roquefort sauce, and declared it, "One of the better steaks I've ever had, anywhere!". He clarified a bit later, "in the top 5 steaks of my life". 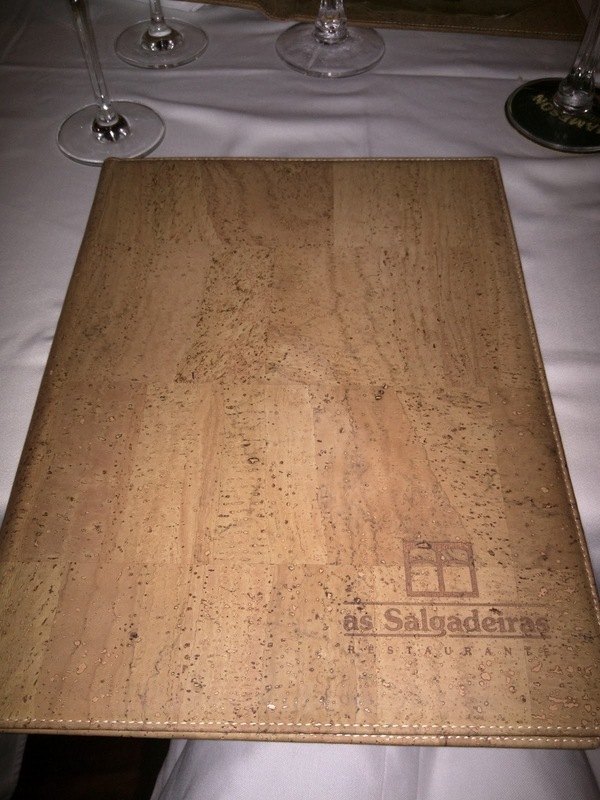 It was also the only example, during our entire time in Portugal, where the meat was cooked as ordered. He asked for rare, and, rare he got, exactly as he wanted. Ojan tried a bite, and agreed it was quite good. I tried the creamy cheese sauce that it came smothered in, and yes, the sauce was good. However, apparently the fries were awful, large steak fries, arranged in a lincoln-log like structure that looked cool, but both Ojan and the guy who ordered the dish declared the fries "terrible". Besides the steak eater, no one seemed particularly happy with their meal choices. The same diner also ordered the white and dark chocolate mousse for dessert, and couldn't finish it, so, I snagged a few bites. Both mousses were unremarkable. The chocolate one was fairly rich. Trilogy of Flavors (for two). 15.75€. For my dessert, I opted for the amazing sounding "Trilogy of Flavors", since it had their signature 3 items , and, you know me, I'm a dessert girl, and I wanted them all. This way I didn't need to pick just one dessert. And I did intend to share. The menu did not say what the three items were, but, I knew that they would be the one I was most excited about, the "Crème Brûlée", plus the “Abade de Priscos” Pudding I wanted to try since I did not like the only other version I had ever had of it at Largo, and the “Conventual” Sweet Eggs. This is the slice at the back of the plate. I knew to expect that form, not a creamy pudding, given that I tried the dish the first time at Largo the day before. I liked this version more that the one I had at Largo, as that one was very, very eggy and I literally didn't want a second bite. This was basically just a thick flan, well set, sweet, but, otherwise fairly boring. I love desserts, and I just didn't feel compelled to eat this or finish it when no one else wanted it either. It wasn't bad, but, it just wasn't good either. 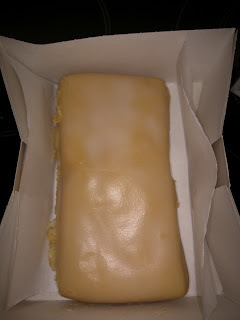 This was the middle item, actually more of a cake. It was served warm, which I wasn't expecting. It had a crispy crust on top and a really strange texture, rather gritty. It was sweet and fairly eggy, and perhaps tasted slightly of saffron? I didn't care for this. Crème Brûlée / Leite Creme. This is the Portuguese version of crème brûlée, crema catalana, trinity cream, or whatever your country calls it, aka, cream, eggs, and sugar. The Portuguese version is cooked on a the cooktop and is topped with a bit of burnt sugar. Since I absolutely adore puddings, and crème brûlée in particular this is what I had my eye on from the start. The consistency was not what I was expecting. It was not thickly set like a firm crème brûlée, but it also wasn't thin and watery. Somewhere in the middle, really, just like a pudding. It was sweet but not too sweet, and had a nice overall flavor. It was my favorite of the desserts, and, after Ojan took one bite (the platter *was* supposed to be shared by two people), I claimed the rest of it. It was certainly the only one I wanted to finish.